Welcome back, loyal Couch Clubbers! It’s so long that we’ve been away from each other and I hope that, like me, you are thrilled that The Flash (and everything #DCTV), is back on the air. At the end of the previous season, we saw Barry Allen facing down against his greatest speedster foe to date, Savitar (a.k.a. evil future Barry Allen! ), and sacrificing himself to the Speed Force in order to protect Wally West, Jay Garrick and the rest of the heroes from Team Flash. I wanted to bring up those two dangling participles from last season because I really think that this fourth season premiere, “The Flash Reborn,” addressed both of them deftly and powerfully. There was never a doubt in my mind that Barry Allen was going to be coming back to the show that was named after him (and, yes, I realize that both Wally West and Bart Allen have taken up the mantle of The Flash). It’s been my hope that we’ll get more cool new speedsters this season (I even wrote an article about who I’d like to see show up! ), although I am hoping that they won’t fall into the role of villain as we’ve seen in the previous three seasons. The Flash heard my hopes and blessed season four with the Thinker, played by Neil Sandilands! Clifford DeVoe (the first Thinker from the Golden Age), was name dropped several times last season and in this episode we finally get the chance to see him on screen. I think it’s pretty amazing that the show has been seeding this character for so long and now we finally bear witness to the payoff. Plus, with the potential for the Thinker’s plan to reach as far back as last season—if not even farther—then this could be the biggest threat Team Flash has faced down so far. Beyond how far the Thinker’s effects can be felt…remember the symbols that Barry was scrawling all over the walls when he first came out of the Speed Force and before he got his mind back? I’m convinced that those are symbols either developed by or tied directly back to the Thinker, and are going to play out as a part of the mystery surrounding him over the course of this season. Let me know if you have any thoughts about the language we saw on display in “The Flash Reborn” down in the comments because I’m obsessed with what it could be! The Thinker is, classically, a Jay Garrick villain who originally menaced the Gotham City underground. While I think a field trip all the way to Gotham is unlikely, I do believe there is the possibility with the Thinker to take Barry Allen and the whole crew from S.T.A.R. Labs to a new setting that we have never seen before. If Barry has to defer to Jay Garrick or fold him in more actively in the plan to take down the Thinker, then this would allow for more development in their mentor/mentee relationship that we’ve really only seen the beginning of up to this point. In this post-Speed Force imprisonment world, Barry Allen’s personality has undergone a pretty significant shift. Last season we saw a much sadder version of the character. He was someone who truly felt the weight of the responsibility of his mantle and the tragedies that his vigilantism had wrought. Now that he’s come back to the world and the woman he loves, Barry has turned over a new leaf. I adored his scene with Iris where he talks about wanting to be more positive. 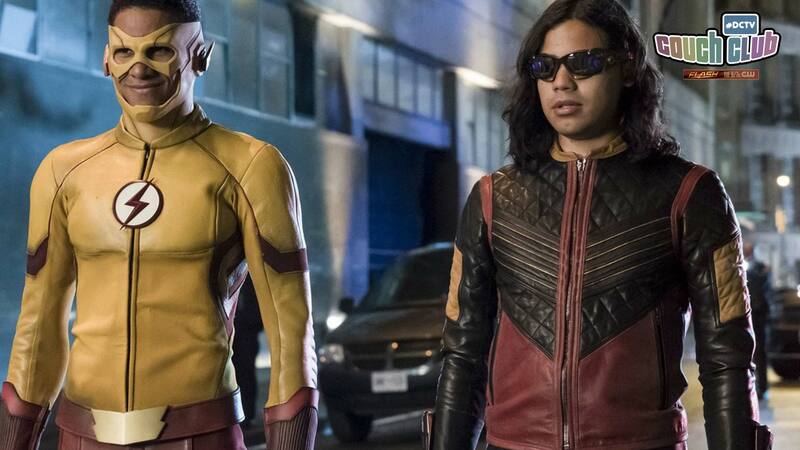 Honestly, this entire episode felt like a throwback to season one except the costumes have the colors ramped up even higher (can we take a second to appreciate how yellow Wally’s new Kid Flash suit is? ), and that is just awesome. In my opinion, something that makes The Flash unique is that it doesn’t have to live in the shadows the way Arrow does. It stands out against a lot of other genre shows in that way and I’m glad to see this season embracing that aspect. The episode is called “The Flash Reborn” and that sensibility extended to all aspects of the episode. There are a couple times we do see an actual rebirth: Barry returning from the Speed Force, Wally putting on the Flash costume, the redefining of what a villain on The Flash needs to be and a return to an early narrative tone, at least for a little while. Annnnnd…this is a great place for me to assign you some homework, Flash fans. The title of this episode also draws from Geoff Johns’ iconic FLASH: REBIRTH series, which you can download here, as well as the current Rebirth FLASH series being written by Joshua Williamson, which you can get caught up on here. Looking forward to reading your thoughts in the comments and do let me know if you decide to pick up any of the comics I recommended here. See you next week!